We describe a simple and reproducible method to measure absolute telomere length (aTL) using quantitative real-time polymerase chain reaction (qPCR). This method is based on the Cawthon method for relative measurement of telomere length (TL) but modified by introducing an oligomer standard to measure aTL. The method describes the oligomer standards, the generation of the standard curve and the calculations required to calculate aTL from the qPCR data. The necessary controls and performance characteristics of the assay are described in detail and compared relative to other methods for measuring TL. Typical results for this assay for a variety of human tissue samples are provided as well as a troubleshooting schedule. This method allows high throughput measurement of aTL using small amounts of DNA making it amenable for molecular epidemiological studies. Compared to the traditional relative TL qPCR assays, the aTL method described in this protocol enables a more direct comparison of results between experiments within and between laboratories. Telomeres are nucleoprotein structures that cap the ends of chromosomes. The integrity of the telomere structure and its DNA hexamer (TTAGGG)n repeat sequence is critical for the protection of the ends of chromosomes from degradation and in maintaining overall genomic stability[1, 2]. The number of DNA hexamer (TTAGGG)n repeats is reduced during each cell division in differentiated cells, and as a consequence telomere length (TL) often decreases in most differentiated cells throughout the lifespan of the organism . Shortening of telomeres can result in telomere end fusions and an increased level of chromosome instability (CIN), which is in turn a key initiating event in numerous cancers (including lung, breast, colon, and prostate cancers, as well as certain leukaemia's)[3–7]. It has been shown that telomere shortening can be accelerated by environmental factors such as psychological and physiological stress, cigarette smoking, obesity and high homocysteine [8–14]. Efficiency of TL maintenance is also affected by gender[15–17]. TL has been shown to be associated prospectively with increased risk of myocardial infarction, coronary artery disease, breast cancer free survival, clear cell renal cell carcinoma survival, post-stroke mortality, dementia and cognitive decline, as well as total survival independent of genetic influences [18–24]. For all of these reasons there has been a burgeoning interest in measuring TL accurately and efficiently to understand both the fundamental biology of telomere maintenance as well as determining the modifiable dietary and life-style factors that contribute substantially to accelerated TL attrition. A wide range of methods have been developed to measure TL such as (i) the gold standard Terminal Restriction Fragment (TRF) analysis by hybridisation of digested DNA with telomere sequence probes, (ii) Flow-FISH cytometry of cells following hybridisation with fluorescent peptide nucleic acid (PNA) probes, (iii) quantitative fluorescence in situ hybridisation (FISH) with fluorescent telomere PNA probes and (iv) qPCR assay. With the exception of the TRF assay all other methods have the disadvantage of generating a relative measure of TL. The advantage of the qPCR method is that, unlike the TRF assay only small amounts of DNA are required and can easily be performed in high-throughput format which is essential for large epidemiological studies [25, 26]. The protocol we describe is a modification to Cawthon's qPCR based relative quantification (Telomere/Single Copy Gene ratio) method by introducing an oligomer standard to generate aTL values. The capability to generate aTL values allows a more direct comparison of results between experiments within and between laboratories. The protocol described here is for human buccal cells or isolated lymphocytes but can be easily adapted to other cell types or species. The measurement of aTL can be performed in any cell population from which high quality undamaged DNA can be collected. However the possibility of detecting meaningful differences between groups is likely to depend on the purity of the cell populations examined because of the possibility of different replicative histories which may affect TL. This is particularly true when doing in vivo studies with white blood cells because the ratios of lymphocytes, monocytes, basophils and granulocytes can vary greatly between individuals depending on their age and health condition(s). Therefore aTL should be measured in populations of single cell types as much as is practically possible. Other sources of variation could be the proportion of dead/dying cells which may have to be taken into consideration because necrotic or apoptotic cells may have a different TL from viable cells. Real-time quantitative PCR (qPCR) uses fluorescent signal detection to be monitored as the PCR reaction proceeds. This allows initial template levels to be precisely and accurately quantified. PCR is an extremely sensitive method of analysis and cross-contamination can lead to erroneous or false results. Therefore precautions and strict quality control ascertainment must be planned into to each and every experiment (further details can be found in ). Prepare 1 litre of the buccal buffer, [0.01 M Tris-hydrochloride (Sigma T-3253), 0.1 M ethylenediaminetetraacetic acid tetra Na salt (Sigma E5391), 0.02 M sodium chloride (Sigma S5886)]. Thoroughly dissolve the salts IN MilliQ water and make up the volume to 1000 ml. Adjust pH to 7.0 and autoclave at 121°C for 30 min. Buffer will last for up to 3 months when stored as a sterile solution in sealed bottles at room temperature. Dimethyl sulphoxide (DMSO) (Sigma, hybrimax, sterile-filtered, #D2650). All solutions used for DNA isolation are purged with nitrogen (immediately prior to use) and supplemented with 50 μM phenyl-tert-butyl nitrone to minimise oxidative damage to DNA. CRITICAL: All oligomers should be HPLC purified; long oligomers (>50 mers) have a high failure rate during synthesis; this means there will be multiple failed sequences which must be removed in order to maintain accuracy of oligomer standards (GeneWorks, Adelaide). All oligomers are diluted in appropriate volume of PCR grade water and stored at -20degC until required. Working stocks of oligomers should be made fresh; dilutions are stable at 4degC for up to 2 weeks. Oligomer sequences are shown in Table 1. Oligomers used for aTL assay in human and rodent. The oligomer standard is 84 bp in length (TTAGGG repeated 14 times), with a molecular weight (MW) of 26667.2. The weight of one molecule is MW/Avogadro's number. Therefore, weight of telomere standard is: 2.6667 × 104/6.02 × 1023 = 0.44 × 10-19g. The highest concentration standard (TEL STD A) has 60 pg of telomere oligomer (60 × 10-12g) per reaction. Therefore there are 60 × 10-12/0.44 × 10-19 = 1.36 × 109 molecules of oligomer in TEL STD A. The amount of telomere sequence in TEL STD A is calculated as: 1.36 × 109 × 84 (oligomer length) = 1.18 × 108 kb of telomere sequence in TEL STD A. A standard curve is generated by performing the aTL qPCR assay on serial dilutions of TEL STD A (10-1 [1.18 × 108] through to 10-6 [1.18 × 103] dilution). Plasmid DNA (pBR322) is added to each standard to maintain a constant 20 ng of total DNA per reaction tube. The standard curve was used to measure content of telomeric sequence per sample in kb (Figure 1). Standard curve used to calculate absolute telomere length. CT (cycle threshold) is the number of PCR cycles for which enough SYBR green fluorescence was detected above background. A) Graph shows standard curve for calculating length of telomere sequence per reaction tube. X-axis represents amount of telomere sequence in kb per reaction. Correlation coefficient within the linear range was 0.98. The graph shown here represents the linear range of the PCR. The DNA amount was optimised so that experimental samples are detected within the linear range. The value generated from the experimental samples utilising this standard curve was equal to kb of telomere sequence per sample. B) Graph shows standard curve for calculating genome copies using 36B4 copy number. Correlation coefficient was 0.99. Standard curves were generated using an AB 7300 Sequence Detection System with the SDS Ver. 1.9 software (Applied Biosystems, Foster City, CA). A single copy gene (SCG) is used as a control for amplification for every sample performed and to determine genome copies per sample. The choice of SCG is critical for reliability of results; any change in copy number can substantially impact upon aTL measurements. We routinely use 36B4, which encodes the acidic ribosomal phosphoprotein P0; b-globin is also frequently used. NOTE: Remember that although telomeric DNA sequence is consistent in mammals, the SCG will be different, thus a SCG standard curve and amplicon must be generated for each target species. CRITICAL: SCG amplification is crucial for the accuracy of the results generated in the aTL qPCR assay; changes in amount of template that is present in each reaction can by affected by pipetting or DNA quantification error. Variation in SCG copy number (CNV) may also occur between individuals and between normal and cancerous cells; CNV can be assessed by using multiple SCG amplicons to generate diploid copies per PCR reaction. The synthesised 36B4 oligomer standard is 75 bp in length with a MW of 23268.1. The weight of one molecule is MW/Avogadro's number. Therefore, weight of the synthesised 36B4 oligomer standard is: 2.32681 × 104/6.02 × 1023 = 0.38 × 10-19g. The highest concentration standard (SCG STD A) had 200 pg of 36B4 oligomer (200 × 10-12g) per reaction. Therefore there are 200 × 10-12/0.38 × 10-19 = 5.26 × 109 copies of 36B4 amplicon in SCG STD A. Therefore SCG STD A is equivalent to 2.63 × 109 diploid genome copies, because there are two copies of 36B4 per diploid genome. A standard curve was generated by performing serial dilutions of SCG STD A (10-1 through to 10-6dilution). Plasmid DNA (pBR322) was added to each standard to maintain a constant 20 ng of total DNA per reaction tube. The standard curve was used to measure diploid genome copies per sample (Figure 1). Power SYBR I mastermix (Applied Biosystems, #4367396). Contains AmpliTaq Gold DNA polymerase, dNTPs, SYBR I Green Dye, opitimised buffers and passive reference dye (ROX) - CAUTION SYBR I Green dye may be carcinogenic when ingested or absorbed into skin. Wear appropriate gloves when working with this solution. 30 ml yellow topped polystyrene containers (Sarstedt #60.9922.918). 10 ml graduated sterile pipettes (Falcon #7551). Milli-Q water (Milli-Q water purification system, Adelab Scientific, SA). Sterile plugged Pasteur pipettes 900 (22-23 cm) (Chase #93P). Syringes 10 ml (Crown Scientific #SS + 10S). Needles 18G (Crown Scientific # 2525RA). Small headed toothbrushes (2 cm head length) (Supply SA, #85300012). Nylon net filters 100 μm (Millipore, #MILNYH02500). 1.5 ml microfuge tubes, DNAse free. The measurement of aTL can be performed in any cell population from which high quality undamaged DNA can be collected. Below are some examples of collection procedures we routinely use in our research. All manipulations must be carried out in a Biological Safety Cabinet Class II. I. Collect fresh blood by venipuncture into vacutainer blood tubes (LiHep or EDTA). V. Remove lymphocyte layer located at the interface of Ficoll-Paque and dilute plasma into a fresh tube using a Pasteur pipette. VIII. Discard supernatant and resuspend the cell pellet in HBSS. X. Centrifuge at 100 g for 10 min. PAUSE POINT: Cells can be resuspended in 200 μl PBS and taken through to DNA isolation step below or if storage required proceed to step XI. XII. Place in Styrofoam box at -80degC. a. Cells can be stored for up to 10 years. XV. Place vial in a beaker of 37degC water and agitate gently. XVI. Once completely thawed, centrifuge vial for 5 min at 300 g.
I. Prior to buccal cell collection rinse mouth twice thoroughly with 100 ml of water. II. Gently rotate a small-headed toothbrush (2 cm head length) 10 times firmly against the inside of the cheek wall in a circular motion. III. The head of each brush is then placed into 10 ml of buffer and rotated repeatedly such that the cells are dislodged and released into buffer producing a cloudy suspension of buccal cells in the buffer. IV. Centrifuge for ten minutes at 100 g.
V. Remove supernatant leaving approximately 1 ml of cell suspension and replace with another 5 ml of buccal buffer. Vortex briefly. VI. Centrifuge at 100 g for ten minutes. VII. Remove supernatant and resuspend in 5 mls of buccal buffer. VIII. Vortex briefly and then homogenise for 2-3 minutes in a hand held tissue homogenizer to disaggregate cell clumps. IX. Draw cells up into a syringe (with 18G needle) and pass through a 100 μm nylon filter into a fresh tube. X. Centrifuge at 100 g for 10 mins and remove the supernatant. XI. Resuspend in 1 ml of buccal cell buffer. XIII. Centrifuge at 100 g for 10 min. PAUSE POINT: Cells can be resuspended in 200 μl PBS and taken through to DNA isolation or if storage required proceed to step XIV. Place in Styrofoam box at -80degC. Place vial in a beaker of 37degC water and agitate gently. Once completely thawed, centrifuge vial for 5 min at 300 g.
I. Centrifuge appropriate number of cells for 5 min at 300 g.
III. Place in Styrofoam box at -80degC. VI. Place vial in a beaker of 37degC water and agitate gently. VII. Once completely thawed, centrifuge vial for 5 min at 300 g.
I. Collect biopsy sample in 3 ml RPMI in a sterile tube. II. Transfer sample to a new sterile tube containing 3 ml RPMI with forceps. Mix by inversion. Repeat twice. III. Transfer sample to cryovial containing 900 μl FBS with forceps. V. Place in Styrofoam box at -80degC. VIII. Place vial in a beaker of 37degC water and agitate gently. IX. Once completely thawed, centrifuge vial for 5 min at 300 g.
Prepare samples according to protocols above; you should have 200 μl of cell suspension in a microfuge tube. DNA isolation is performed as per manufacturer's directions (Qiagen, DNeasy Blood and Tissue Kit) with slight modifications. 1. Add 20 μl proteinase K (600 mAU/ml). 2. Add 180 μl Buffer AL (tissue and cell lysis buffer). 3. Mix by inversion 10-15 times. 5. Add 200 μl Ethanol. 7. Incubate at room temperature for 3 minutes. 8. Pipette mixture into spin column. 9. Centrifuge at >6000 × g for 1 minute. 11. Pipette 500 μl Buffer AW1 (wash buffer) into column. 12. Centrifuge at >6000 × g for 1 minute. 14. Pipette 500 μl Buffer AW2 (wash buffer) into column. 15. Centrifuge at >6000 × g for 1 minute. 17. Centrifuge at >6000 × g for 2 minutes. 18. Transfer spin column to clean microfuge tube. 19. Pipette 200 μl Buffer AE (elution buffer) into spin column. 20. Incubate at room temperature for 1 minute. 21. Centrifuge at >6000 × g for 2 minutes. 22. Pipette eluate back onto spin column. 23. Incubate at room temperature for 1 minute. 24. Centrifuge at >6000 × g for 2 minutes. 25. Add 1 mM DTT to eluate. 27. DNA was quantified in triplicate using a NanoDrop spectrophotometer. b. 5 × 106 lymphocytes or cultured cells should yield 10-20 μg of DNA; 5 × 105 buccal cells approximately 1-5 μg DNA. All samples are run on an ABI 7300 Sequence Detection System with the SDS Ver. 1.9 software (Applied Biosystems [AB] Foster City, CA). 30. Prepare master mix solution (Table 2). Prepare enough for samples to be run in triplicate, no template control (NTC), positive control (1301 cell line DNA), standards (which should be run on every plate) plus an extra 5% for pipetting error. Representation of master mix preparation. Example of reaction plate set up using 24 samples. 35. Pipette required volumes of standards, positive control and water for NTC into their respective wells. 41. Cycling conditions (for both telomere and 36B4 amplicons) are: 10 min at 95°C, followed by 40 cycles of 95°C for 15 sec, 60°C for 1 min, followed by a dissociation (or melt) curve. 45. Setting baseline. Because TEL STD A will amplify very early (at approx. Ct 5) you may need to alter background parameters on the qPCR output window. 46. Standard curve. Check standard curve by using results from TEL STD A dilutions. Using these concentrations you should observe the linear range of the reaction. 47. Ensure all target samples fall within the linear range - any samples that amplify outside this linear range should be removed from further analysis. 48. Check replicates for variation. Individual samples are analysed in triplicate and accepted only if the standard deviation of the Ct values are <1Ct (CV > 5%). It is expected that 90% of samples analysed will meet this criterion. Samples with differences in standard deviation greater than 1 Ct values should be removed from further analysis and re-analysed. 49. After amplification is completed the AB software produces a value for each reaction that is equivalent to kb/reaction based on the telomere standard curve values. 50. Repeat from step 30 with single copy gene primers in reaction. 52. The kb/reaction value is then used to calculate total telomere length in kb per human diploid genome. 53. The telomere kb per reaction value is divided by diploid genome copy number to give a total telomeric length in kb per human diploid genome. 54. OPTIONAL: This value can be further used to give a length per telomere by dividing by 92 (92 is the total number of telomeres on 23 pairs of chromosomes found in normal human cells). DNA from the 1301 lymphoblastic cell line can be used as a long telomere control (telomere length of 70 kb) in each plate run. The inter- and intra- experimental coefficient of variation of the 1301 telomere length measurement by absolute qPCR should be less than 7% and 2%, respectively. The performance of the qPCR method for aTL it can be tested by comparison to the gold standard of telomere length measurements, Terminal Restriction Fragment analysis (TRF) . Telomere lengths are determined by a TRF diagnostic kit (Roche Diagnostics, Australia). For example our studies demonstrated a strong correlation between results for TRF and the qPCR method for aTL (r2 = 0.75, p < 0.0001) (Figure 2). 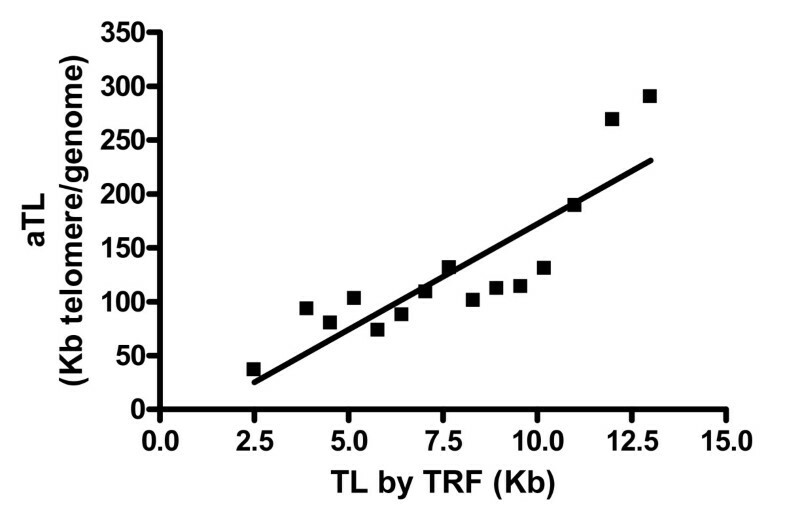 The TRF measurement for the 1301 B-cell derived lymphoblastoid cell line, commonly used in Flow-FISH analysis of telomere length was reported to be 80 kb . Using the absolute Real-Time PCR method, we measure the average telomere length for 1301 at 70 kb. 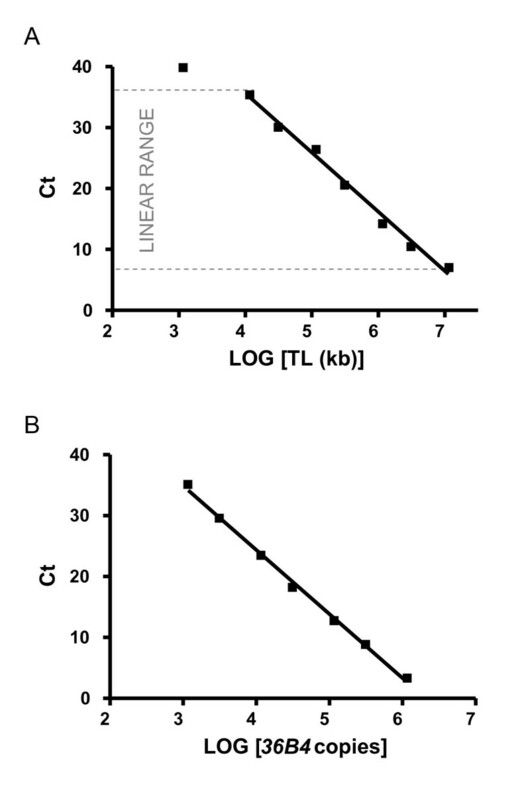 Comparison of telomere length measurement methods. Graph represents correlation between the TRF and aTL methods. Telomeres were measured in whole-blood, lymphocytes, mid-rectal biopsies and low and high controls (Telo-assay, Roche) (r2 = 0.75, p < 0.0001). Telomere lengths, in different cell types, showed good agreement between the reported TRF values and the measures we obtained by the absolute qPCR method (Figure 2). However, there is a consistent discrepancy between the values obtained by the two methods with the TRF value being approximately 7 kb greater than that observed with the aTL[33–35]. It is recognised that the TRF method tends to overestimate telomere length because there is a considerable, highly variable, non-telomeric DNA component within TRFs . In contrast, aTL only detects and amplifies intact TTAGGG sequences (Figure 3). In addition to TTAGGG, terminal restriction fragments in human DNA contain variable amounts of TTAGGG-like repeat sequences, which are detected as telomere sequence in the TRF assay. These include telomere repeat variants proximal to the telomere and the telomere adjacent sequences (reviewed in ). Additionally, as TRF is based on hybridisation the shorter the telomere the lower the hybridisation signal, consequently there is a telomere length threshold below which TRF analysis will not detect telomeric DNA. Although TRF analysis biases towards longer TL, this can be partially corrected by dividing the signal intensity by length in base pairs , although this is not always done. Schematic representation of aTL measurement by qPCR. One pair of chromosomes is shown, circles represent centromeres. Regions containing telomere repeats (TTAGGG)n are coloured blue. As shown, telomere lengths can vary between chromosomes and even between the two ends of a single chromosome. The arrows represent the primer pairs used to amplify the telomere sequences. The telomere PCR signal is a measure of telomere length, because the number of telomere primers that can bind the telomeric DNA at the beginning of the PCR is directly proportional to the total summed length of all the telomeres in the cell (adapted from ). Low quality DNA/low yield. There are several possible causes for low yield/quality DNA. The most common reasons include inappropriate storage of sample following collection, non optimal starting amount (too much or too little) of sample collected, and insufficient cell lysis. Suggestion: Reisolate DNA from starting material. Low/no amplification in PCR (positive controls and standards). There are several possible causing for low/no PCR amplification. Suggestion: Check primer dilutions, you may need to set up fresh working dilutions of primers from oligomer stock. Polymerase not working efficiently. Suggestion: Check PCR cycling to ensure appropriate activation of DNA polymerase is in place; select new aliquot of master mix and repeat PCR. Fluorescent dye not working. Suggestion: Check PCR machine setting to ensure appropriate detection method for SYBR Green is selected; select new aliquot of master mix and repeat PCR. Low/no amplification in PCR (samples). Amplification in NTC. It is important that you determine the cause of this amplification; results from plates with NTC amplification should not be used. Suggestion: First check dissociation curve plot to determine likely causes of amplification in NTC; gDNA contamination or primer dimer formation. If cause of amplification in NTC is contamination (usually in the PCR set-up) change water and repeat NTC. Primer dimer formation is another cause of signal in the NTC wells. This amplification can be identified via examination of the dissociation curve; primer dimmer dissociation curves will appear very different to telomere dissociation profiles. A typical data set from lymphocytes and buccal cells of 18 males and 25 females in a young group (aged 18-31 years), and 25 males and 23 females in an older group (65-75 yrs) is shown in Figure 4. For the young group the lymphocytes had a mean aTL of 97.2 kb/diploid genome (range 35-260); the buccal cells had a mean aTL of 211.2 kb/diploid genome (range 45-594). The lymphocytes from the older group had a mean aTL of 86.6 kb/diploid genome (range 35-174); the buccal cells had a mean aTL of 230 kb/diploid genome (range 33-750). 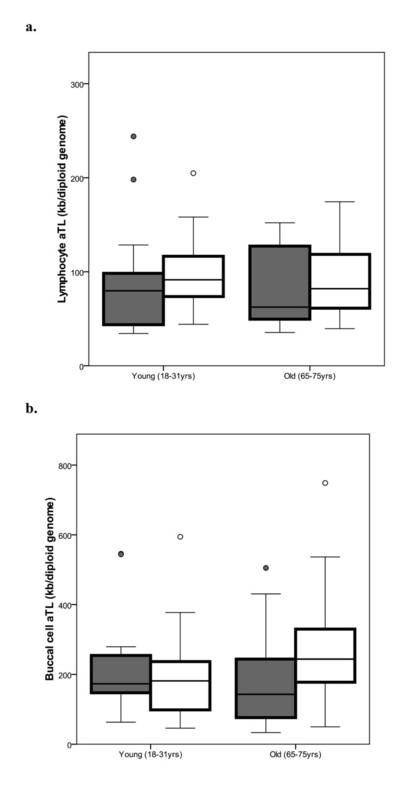 Anticipated results of absolute telomere length in lymphocytes and buccal cells. This cohort comprised 18 males (grey bars) and 25 females (open bars) in the young group (aged 18-31 years), and 25 males (grey bars) and 23 females (open bars) in the older group (65-75 yrs). Graph A shows the lymphocyte telomere length decreases with age in both males and females; Graph B shows buccal cell telomere length decreases with age in males, not in females. Data are shown as box plots which represent five-number summary of the data (the minimum, lower quartile, median, upper quartile and maximum). We are very grateful to the volunteers who consented to participate in the studies used in the validation of this protocol. We thank all current members of the Nutritional Genomics Research team at CSIRO Food and Nutritional Sciences for their supportive and productive working environment. We acknowledge Dr Phil Thomas, Dr Varinderpal Dhillon and Dr Caroline Bull for their contributions. NJO conceived the method, designed and carried out the validation of the study and drafted the manuscript; MF was involved in the conception, design and supervision of the method development. All authors read and approved the final manuscript.